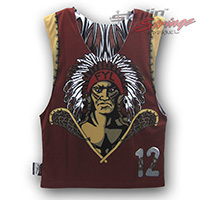 The Farmington sublimated lacrosse shorts were designed with a custom side panel insert to match the design style of the numbers on the back of the pinnies. The leather look with the tassles make these a unique looking short. The F logo on the front right leg looks like stone with a few feathers tailing.